Gemini sometimes feels that he will drown, forced to swim in the waves of emotions. However, these waters are a natural element of Pisces, which suffocate in the air, the elements of Gemini. At first glance it is noticeable that the internal dynamics of Gemini and Pisces are completely different. But before you come to the inevitable conclusion of incompatibility, it is worthwhile to think about what these signs can give, namely - about the invaluable intuition by which they live. As the twelfth and last sign of the zodiac, Pisces sympathizes with everything that happens in life. Pisces is not one who rejects anything only because of an inconsistency with the ideal: they value any experience and level of being. Twins are naturally receptive. They do not bathe in feelings, like Pisces, but try to understand other people, because Gemini values ​​differences rather than similarities. As a child, Gemini radiates curiosity and a desire to find out what is happening in the world and how. Twins never get tired of asking questions: that’s why they are by and large always children. At sixty years of age, Gemini has the same vivid and restless mindset as in childhood, absorb information that other characters may not consider essential, but which nevertheless represents an inexhaustible source of interest for Gemini. It is important to lay a solid foundation for this inquisitive mind. In the mental attitude, Gemini needs to expand horizons and practice if they want to know themselves and their role in the life of the universe. A loving mother-fishes wraps her child with warmth and well-being, but his restlessness suggests that he constantly eludes her. Gemini does not have time for all of her affection, and so Mommy-Pisces, with her good feelings, may remain unclaimed. And she so would like to feel a constant love for yourself! Still, the little Gemini is probably very fond of her, because she is such a sympathetic listener and allows you to experience all his vast plans and brilliant ideas. 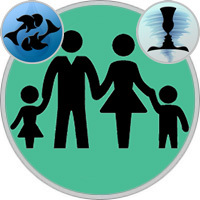 Mother-Pisces has much more emotionality and intuition than her logical-thinking Gemini-child. But, despite their differences. Fish always allows him to be himself, that is, to think, talk, create as he wants. And this is vital for Gemini. There are, however, periods when his insistent inquiries weary her. Then she just needs to be alone to take a break from his chatter and relax a little. This mother knows how to laugh like a child with her Gemini and enjoys his fun, if only she has enough energy for it. But how can she keep up with his verbal acrobatics? And she can not stand it when he hones his wit on it... Pisces are very vulnerable, and the mother does not always know how to confront her too smart child. At times, she finds him too carefree, but she herself prefers to do without strict discipline. She still has to establish for him some restrictions, if she does not want him to prevail over her. If the rules are reasonable, he will react correctly and understand their validity. Well, Mom does not need to accumulate his dissatisfaction, otherwise both will begin to communicate with each other in high tones. Sociable Gemini likes how his mother treats people. And it’s so great that she is such an inventor and knows how to not only find an interesting job for him, but also teaches him life in the broadest sense of the word. Dad-Pisces is happy to have children, but he somehow did not expect such a vigorous and energetic child... The twins ask questions endlessly and always drag their father’s hand away, so that Pisces is sometimes difficult to cope with such a vortex of activity. This dad is excellent when it comes to developing the creative imagination of Gemini. Pisces are very artistic and creative, and these two can spend hours enjoying drawing, music, making models or making up different stories. The father wants the child to have all the best, and he spends no time trying to find out exactly what his child will be interested in. He will not forget about such activities that will help get rid of the surplus of nervous energy. However, he will never understand the analytical approach of the child to any information or interest in everything new. The pope perceives life more measuredly. Gemini even thinks that his father is too passive or just lazy. Both of them understand that they do not belong to the most straightforward personalities, however, they are not one of those who wear a stone in their bosom. The father sometimes breaks his promises: what he said yesterday may not matter today. Gemini has such a vivid imagination that he is able to compose stories that his father is embarrassed. And no one is sure that the other says exactly what he thinks. Sometimes Fish even envies the energy and ingenuity of his child, but Gemini draws inspiration from his father. Father encourages Gemini in his endeavors, but does not impose anything. And for Gemini, it’s just wonderful!